FAA’s ATADS data shows Peak Year was 2004. Total airport operations in 2014 were DOWN 11% from the peak year. The Chicago O’Hare International Airport began in 1942, when the U.S. War Production Board acquired 1,790 acres of flat prairie called ‘Orchard Place’. A factory was built to produce Douglas C-54’s for the war effort, and the Army Air Force built a Special Depot for the storage and testing of captured enemy aircraft. Once the war was over the production facility closed and the U.S. Government transferred 1,080 acres to the city, for use as a civilian airport. The airport identifier, ORD, is derived from the airport’s name during WWII: Orchard Place/Douglas Field. The airport opened to commercial passenger service in 1955, and President Kennedy dedicated the new/improved facilities in 1963. In the early 1960’s, O’Hare surpassed the busy airport at Midway [KMDW] (which had been the busiest U.S airport, ahead of LaGuardia [KLGA], from 1948 to 1960), and soon became the world’s busiest airport in terms of airport operations. In 2005, O’Hare was surpassed by Atlanta [KATL] and became the world’s second busiest airport. Today’s airport has four terminals and 182 gates, and is a major hub for United/Continental and American and their many regional feeders. The airport sits on 7,627 acres and has no based aircraft. Up until November 2008, the airport had three sets of parallel runways, and ran a complex ATC operation, with simultaneous operations on runways with intersecting flight courses. The way to manage this complexity is typically to assign an extra controller to the tower, with the duty to watch the timing of the crossing flights and direct other controllers exactly when they need to clear their specific flight (this eliminates the need for that primarily local controller to monitor the potential conflict, so he/she can concentrate on the overall flow to his/her principle runway). This system does break down, if the monitoring controller errs in their judgment, or becomes lulled into complacency due to the repetitive activity. 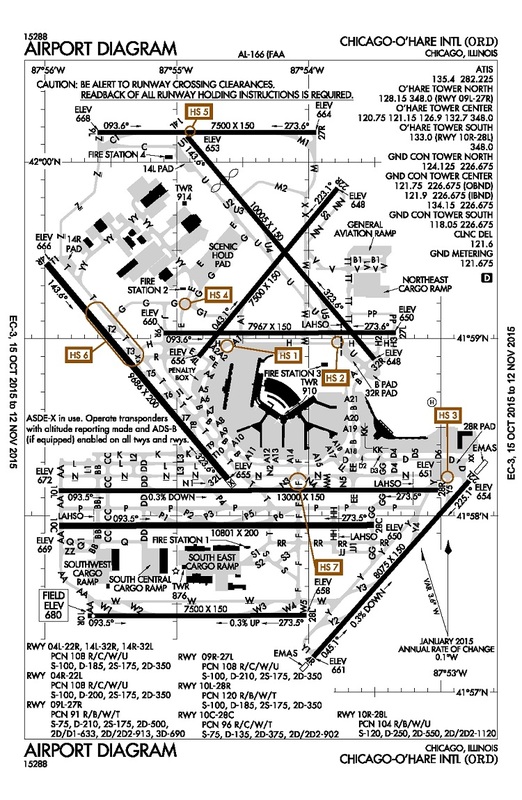 An example of this type of controller error has occurred where Runway 32L departures conflict with arrivals to Runway(s) 9; e.g., see the NTSB reports for 7/21/08 and 8/8/11. With the addition of Runway 9L in November 2008, airport capacity and operational simplicity were both greatly increased. However, this new runway, a mile north of the center east-west runway, also greatly expanded the noise and pollutant impact upon airport neighbors. FAA staffs a 24/7 control tower, and averages 2,416 operations per day (50 takeoffs per hour). As shown in the ATADS data table, traffic peaked in 2004, but has since declined by 11%.